One of the luxuries of living in India is that people are so enterprising you can count that every service imaginable exists and can be quite specialised. For example, would you ever believe that someone would come to your house on a Sunday to sell only 5 specialised Indian bakeries’ biscuits? I would never have imagined so. The first time I met the biscuitwala ‘bhaiya’, it was a very lazy Sunday morning. S and I were contemplating what we should do for brunch. The doorbell rang and I was told the biscuit man was here if I wanted to pick something up. I was very intrigued. I wasn’t sure if I really wanted something but I wanted to check out this concept as I had never heard of it before. As I stepped outside I saw a very pleasant looking man who greeted me with a smile and a namaste. He had, by his side, opened up a large aluminium trunk or ‘peti’ which was lined with plastic and filled with biscuits. I immediately recognised some of the standard Indian-Irani bakery biscuits! 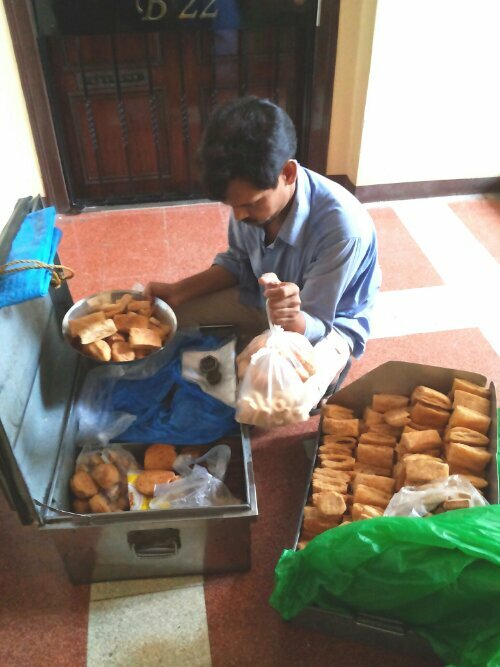 He had khari biscuits, butter biscuits and jeera biscuits. Khari biscuits are savory and are a little bit like puff pastry or filo pastry. 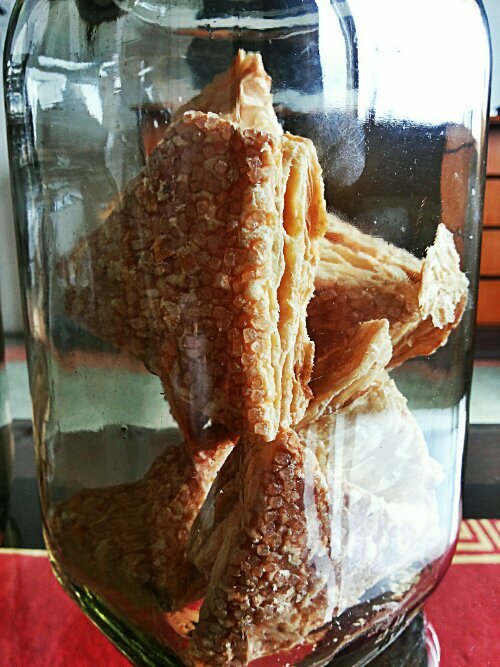 They have many thin layers which are well buttered to create a crisp, light biscuit that gives you a slight snap when you bite into it and crumbles a little. They taste excellent with tea or dipped in tea. Almost like a Mumbai classic. 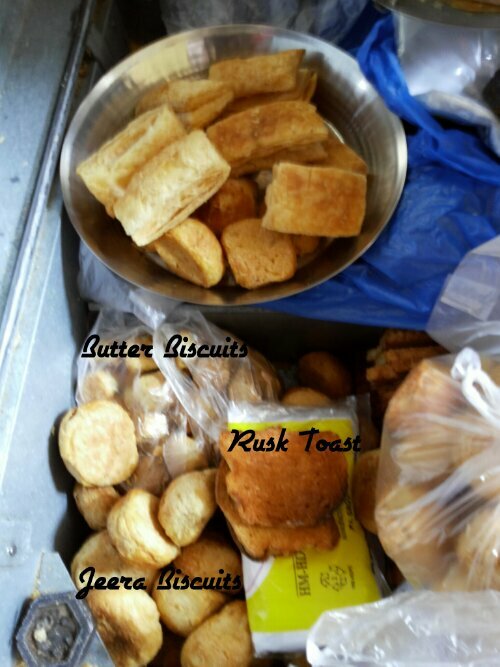 Butter biscuits are small round biscuits flavored with jeera or cumin. They are rich and buttery and are slightly salty. These go very well with typical Indian tea which is sugared. Jeera biscuits, also called as ‘poor man’s biscuits’, are flavoured again with cumin or jeera and have very little butter. Hence the name, poor man’s biscuit. They are very crispy and leave crumbs add you bite into it. 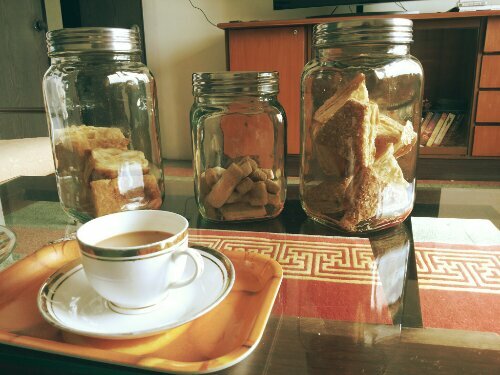 The other three varieties that I couldn’t recognize were badam maska biscuit, sugar topped khari and rusk toast. Badam maska biscuit, literally meaning almond and butter biscuits are shaped into small fingers. They are slightly sweet with a hint of cardamom and lots of butter! No surprise that they are my favorite!! I love them dipped into a hot cup of masala chai! Sugar khari is simply khari biscuit topped with sugar grains. 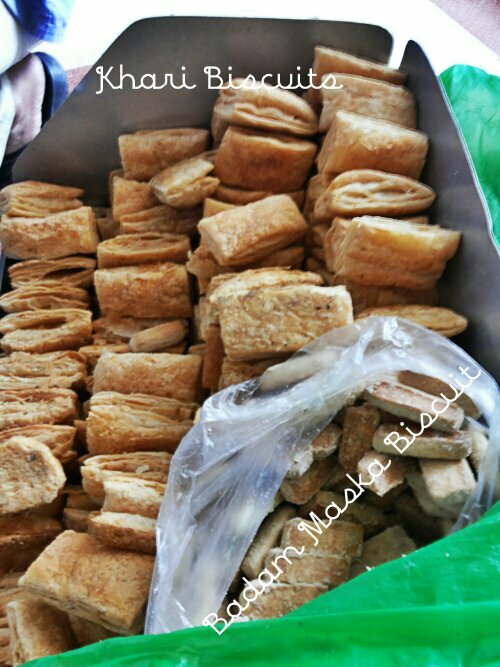 Rusk toast is a very hard biscuit which had a lot of fibre. It is slightly sweetish and to be honest I do not enjoy them much. I asked the bhaiya if he made them himself. He said he gets them fresh from a bakery and goes around selling then on Sundays. I believed him when he said the biscuits were fresh because they were warm when he handed them over to me. He is originally from Gorakhpur and has apparently been around for years. He normally rings the bell on every floor to see if anyone wants anything. I would assume he visits a few other buildings in the area as well. He is such a sweet and polite man. I asked him a lot of questions because I was so intrigued by him and his concept, but he answered them all patiently and seemed happy to do so. I find the whole concept so wonderful and interesting. It is a testimony that we, in India, have so many luxuries. If you have someone who comes to your doorstep and sells such unusual goods, do let me know! Would love to hear more. But for now I’m going to. Spend my Sunday enjoying a hot cup of tea and delicious fresh biscuits! It was a very lovely post, the pics brought back memories.